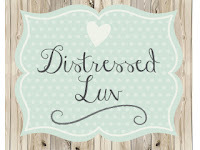 BIG NEWS - we've changed our name!!! Hop on over to our brand new website GoBeLoveInternational.org and watch our new video to find out exactly why we've changed it. We will keep this blog live for folks who want to come and read older posts but we're starting fresh with a new website, new blog and a new name! Our big news for October is that we are finally launching our new missionary care program, called Project G.P.S. This effort has been in the works all summer and we are thrilled that the time has arrived! In fact, the very first Project GPS parties are happening this week! We couldn't be more excited about this program and as you'll see from the testimonials below, our missionary partners are pretty excited about it too. Click here or on the image below to watch our brand new video and learn all about how our ministry comes alongside our partner ministries and what Project G.P.S. means to those serving overseas. These days, VO is becoming about so much more than sending short-term mission teams. Sure, that’s a big part of what we do and we will always send teams to the mission field — but it’s not all we do. At our core, we are about coming alongside long term ministry and missionary efforts. Our job is to hold up their arms and to support them. Project GPS is just one way for us to do that. So what is Project G.P.S.? G.P.S. stands for Gathering. Packing. Supporting. It’s a unique way for “senders” and “goers” to work in partnership and it’s simple! 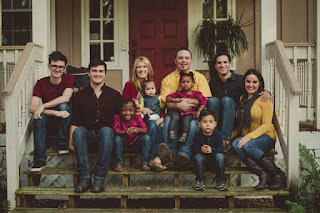 People at home sign up to host Project GPS parties and are matched with a VO approved missionary or missionary family. Missionaries provide “wish lists” of the things they need for themselves, their children, and their ministry; these are items that cannot be obtained or are cost prohibitive on the mission field. GPS party attendees shop for wish list items ahead of time then come together to pack a crate, create cards and letters of encouragement, and to pray for the missionary family they’ve been assigned. A traveling VO team member will carry over and deliver the crate on an upcoming trip. "Encouraging long term missionaries helps them to be able to encourage and build up the local people.It’s a neat illustration of the Body of Christ at work. Long term mission work may look glamorous from afar, but the day to day realities we face often leave us tired and discouraged at times. It’s not an easy life by any means! So, I’m very grateful to anyone who wants to provide encouragement in any way and free luggage space is something most missionaries long for!" 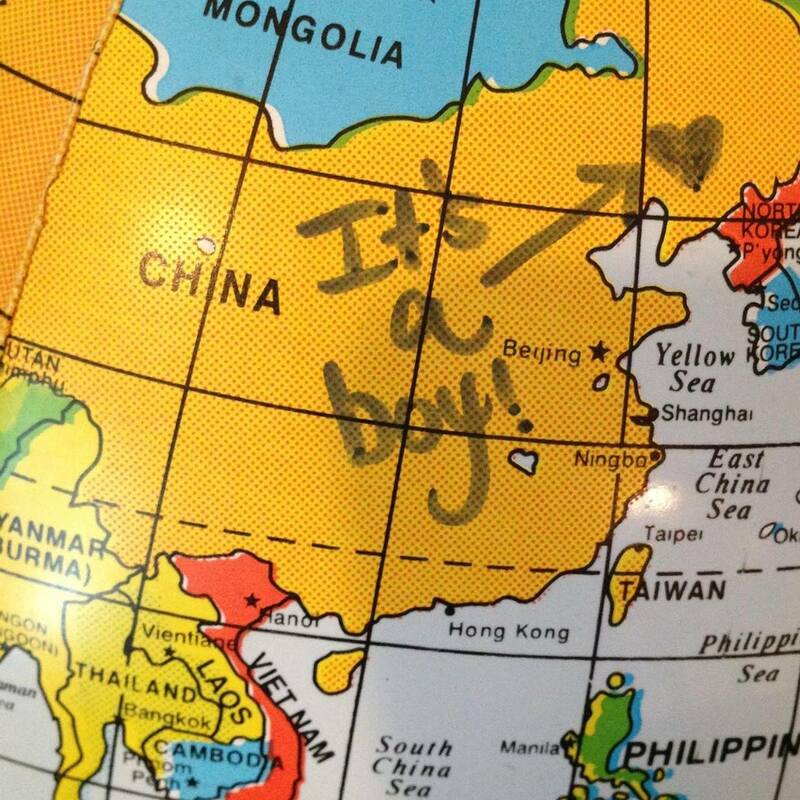 Our family adopted our first daughter in June of 2015 from China. 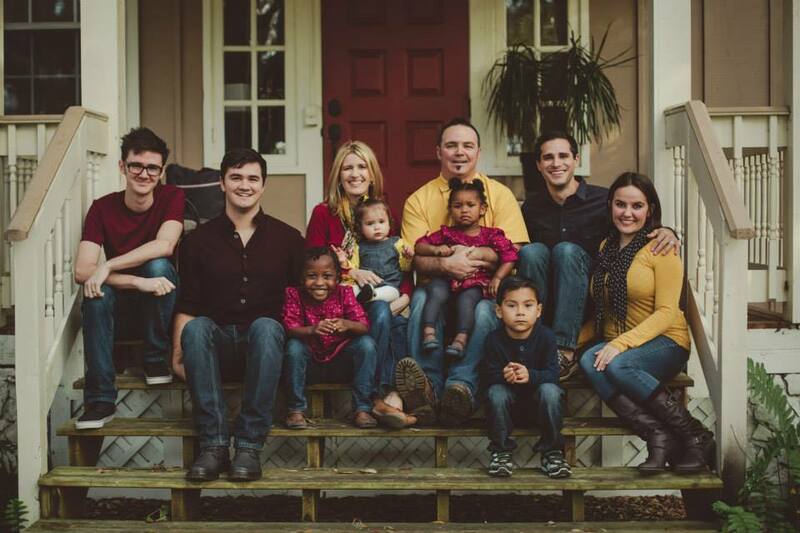 My husband, Jeremy, and I (Angela) knew from the beginning of our marriage that we felt called to adopt. However, the Lord led us on many journeys before adoption. We fostered, gave birth to our three biological sons, and then we began the international adoption process in 2010, almost eleven years into our marriage. Our hearts were set on China from the beginning, but due to a cancer history, doors closed for us to choose China, so we prayed and felt drawn to Africa. Through that process, we began networking, researching and began an adoption and orphan care ministry at our local church. Jeremy travelled to Africa, we developed lifelong friends there. We completed our paperwork and got on a wait list, open to bringing home two girls. After waiting four years and no adopted children yet home, we began asking some questions and our hearts wrestled. What was God’s plan for us? Our adoption agency laid out the choices if we changed direction. And, China was again on the table if we were open to a child with special needs. 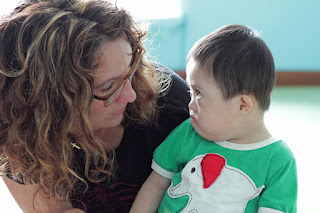 We prayed more and through a series of events throughout our lives, we both desired to adopt a child specifically with the need of Down Syndrome. Two weeks later, I read a blog of a friend of a friend on Facebook. “A Family for Lee Lee” was the title….first my heart and then Jeremy’s as well, was captured and captivated by this child and her story. We asked questions, prayed, cried, wondered, dreamed…could she be our daughter? Within a few weeks time and after witnessing several miracles, it was evident that she was indeed our daughter we had longed and prayed for all those years. 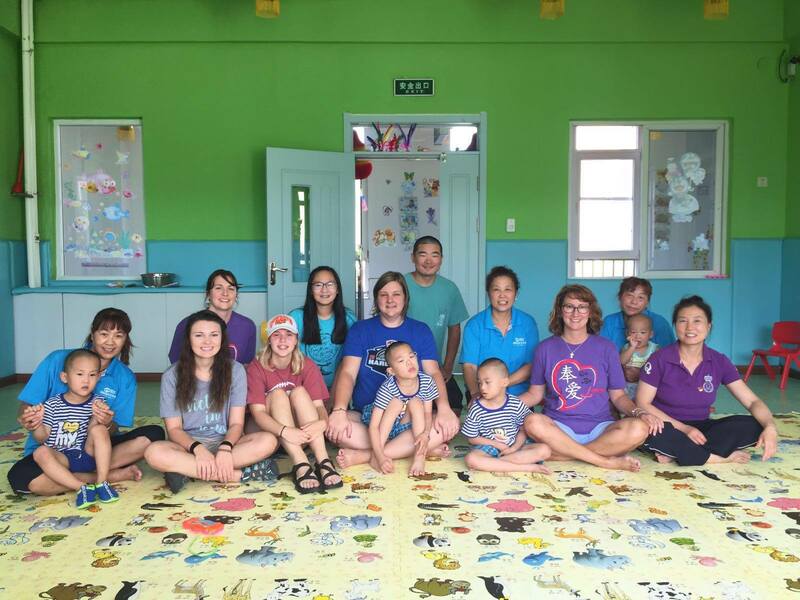 A Visiting Orphans team had visited Lee Lee’s orphanage in the summer of 2014. It had been several years since a team had visited that orphanage. Relationships were made, children were loved, nannies were encouraged. The team asked about Lee Lee, could she be adopted and the orphanage staff said she did not have paperwork ready for adoption but, “if you will find her a family, we will make her a file.” And, so they found her a family through advocating for her, sharing her story, and praying diligently. Our family has been blessed beyond measure by the obedience of that team to Go Be Love in China. Lee Lee may not yet have a family if it were not for these ordinary people that took on an extraordinary challenge to Go Be Love in another land. On our adoption trip in the summer of 2015, we enjoyed our time in China, but my heart broke as we boarded the plane to return to the USA. I was ready to sleep in my own bed, eat American food, enjoy the comforts of home, but part of my heart was being left in China. What about the other children in the orphanage, the nannies and other staff? I knew then I not only wanted to go back…Some day, I had to go back. In the fall of 2015, a friend shared with me that Visiting Orphans was giving away a free mission trip! I was excited to see this opportunity and decided to enter the contest, only by the easier ways, sharing on Facebook, giving a donation,etc. But the trip deposit payment had the most entries and the deadline was coming soon. I felt drawn to commit, to say I would go even if I didn’t win. I talked to my husband and he was in agreement, as I had wanted to go on a mission trip for a long time anyway. But, then the fears crept in, doubts reared up, procrastination set in. I waited till the last night of the giveaway and after the house was quiet, I sat down to talk to God one more time about this trip giveaway. The what if’s came out: what if it was hard for my family to leave them for two weeks, what if we don’t have the rest of the money right now, what if it’s not going to be easy….I rationalized, debated, fretted, and finally, I felt I would have no peace until I said yes and hit send on that computer screen. With three minutes to spare, I hit the button to confirm my entry and the trip deposit was paid. A few days later, the drawing happened. I remember thinking about it that day, wondering, hoping. 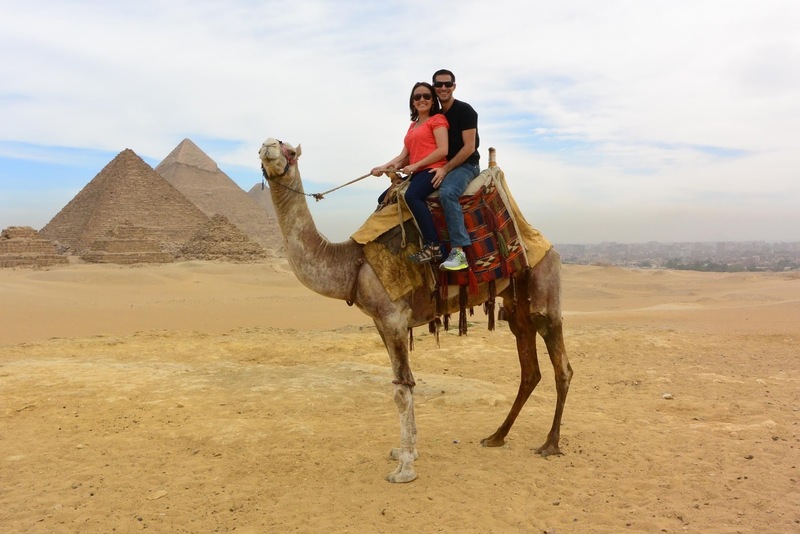 And that night, I got one of the best phone calls ever: I won the trip giveaway! And, the entry that was drawn in the drawing was from the trip deposit payment! I had almost missed this opportunity by three more minutes. 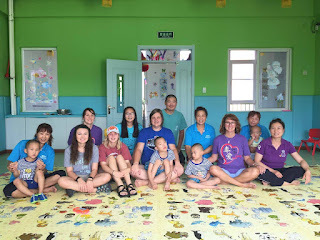 Because of this mission trip giveaway, I was able to join one of the Visiting Orphans China teams in July 2016 to return to the same orphanage our daughter was adopted from just a year before. To go back there to those that knew and cared for our sweet “Lee Lee,” who was now known as Lia, was one of the biggest blessings and amazing gifts I’ve ever received. “Going" got me out of my comfort zone, opening my eyes and ears to see and hear what God wanted for me. “Being” gave me a front row seat to the needs of others and what God is doing globally, to be present with the orphan and those that care for them. And “loving” helped me to get a clearer picture of what it means to be Jesus with skin on, the reality that we are the only Jesus some will ever see. This trip was life-changing for me. Angela with the 2016 China team on the trip she won! While I was away in China this summer on this 2 week trip, God revealed to my husband in my absence that our family has been called to adopt again from China. I had felt this same call for some time, but we both needed to be on the same page and unified in this decision. So, my last minute surrender to hit “send” on that trip deposit for the contest???? It has even further reaching implications than I’d ever imagined. McKensey joined the Visiting Orphans staff in February of 2016 as our Accounting Specialist and we are thrilled to have her. Here's a bit about the newest addition to our staff family. 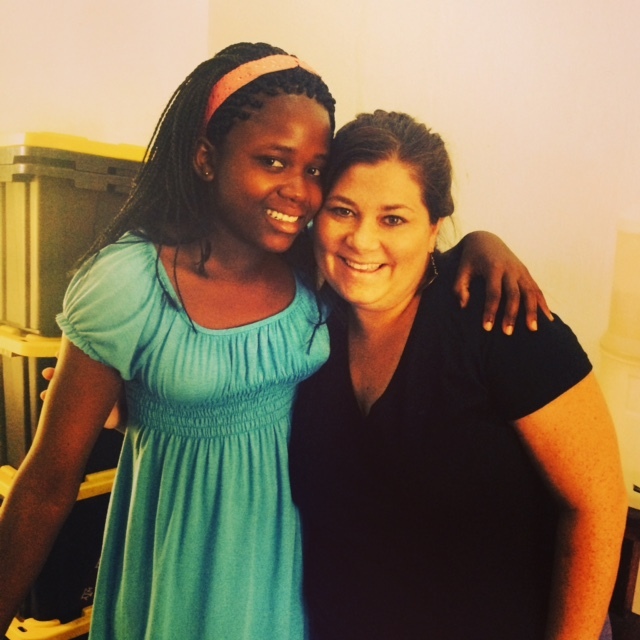 God began to weave missions into the heart of McKensey’s life story in high school with her first trip outside the US. On a medical mission trip to Guyana, South America she met a young boy caring for his two younger sisters -children caring for children, helpless, alone and, afraid. This was the beginning of her seeing those in need with new eyes. In her college years, McKensey spent six weeks in Uganda one summer -worshipping in mud huts, seeing children carry jugs of water on their heads, realizing how often we take the blessing we have in this country for granted. After graduating, McKensey spent three years in Uganda this time as a member of the mission team -using her degree in business to grow a faith based nonprofit, working alongside Ugandans at The Source, a café and resource center serving the community. 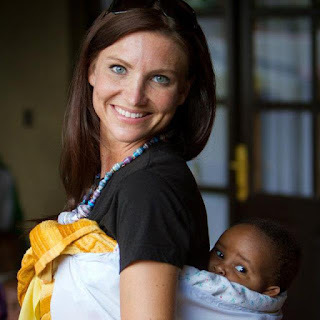 In her free time, she volunteered at a local orphanage-holding babies whose lives were so full of hope yet mixed with despair, realizing not all children begin with a mother and father who are elated at their arrival, contemplating how to bring hope to a broken world. 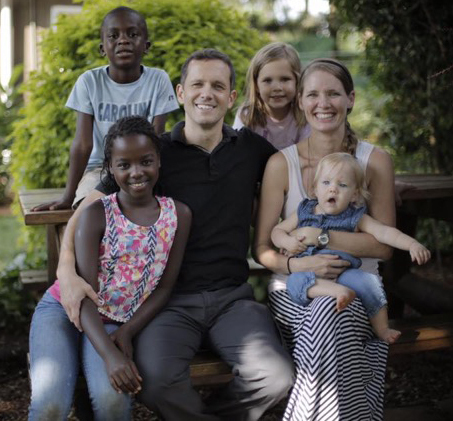 The story continued to unfold as God brought McKensey back to the US to serve for eight years as the Director of Finance for Show Hope. Here she used her gifts of administration, detail, and organization to advance the Kingdom. 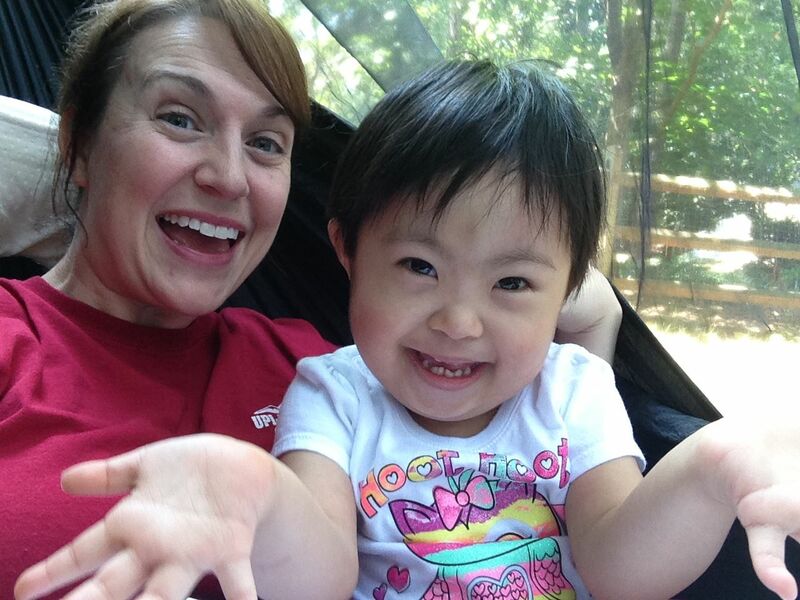 She had the opportunity to lead several mission teams to China and forever changed the lives of children with special needs who long to know the love of a family. McKensey is excited and grateful to be serving alongside Visiting Orphans as they carry out their mission to Go Be Love to the people of this world. Isaiah 61 reads, “The Spirit of the Sovereign Lord is on me, because the Lord has anointed me to proclaim good news to the poor. He has sent me to bind up the brokenhearted, to proclaim freedom for the captives and release from darkness for the prisoners, to proclaim the year of the Lord’s favor and the day of vengeance of our God, to comfort all who mourn, and provide for those who grieve in Zion— to bestow on them a crown of beauty instead of ashes, the oil of joy instead of mourning, and a garment of praise instead of a spirit of despair. They will be called oaks of righteousness, a planting of the Lord for the display of his splendor.” This verse embodies McKensey’s heart as she desires to serve the Lord with her life by sowing seeds of light and love, healing and hope. McKensey has called Nashville, Tennessee home since 2007 and is blessed to share life with good friends and a wonderful family. She likes traveling, laughing, and being outdoors. In her spare time she enjoys offering color analysis sessions, watching Hallmark movies, talking about alternative healthcare and spending time with her awesome niece and nephew. 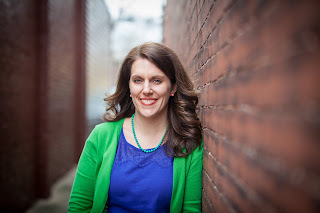 I am so honored to be featured on VO’s blog today! My journey with VO started back in 2012 when a friend of mine told me she was leading a trip to Kenya & Uganda with them. I immediately felt a whisper in my heart that I was supposed to join her team! The timing was crazy as my husband and I already had plans to serve on a missions trip to Alaska that same summer for a whole month, and between both trips and the cost of missed work, we needed to fundraise nearly $10,000! We took the step of faith and I told God that if He really wanted me to go on this VO trip, He would have to provide. Well, He did and less than a week after returning from Alaska, I boarded a plane to go serve in Kenya & Uganda. It was wild! The entire trip was absolutely incredible in every way. I had been on many different missions trips before, but this trip absolutely impacted me the most as we specifically loved and served orphans. I love children and have a huge heart for orphan care so this trip felt like it was designed specifically with me in mind! I did not want to come home! 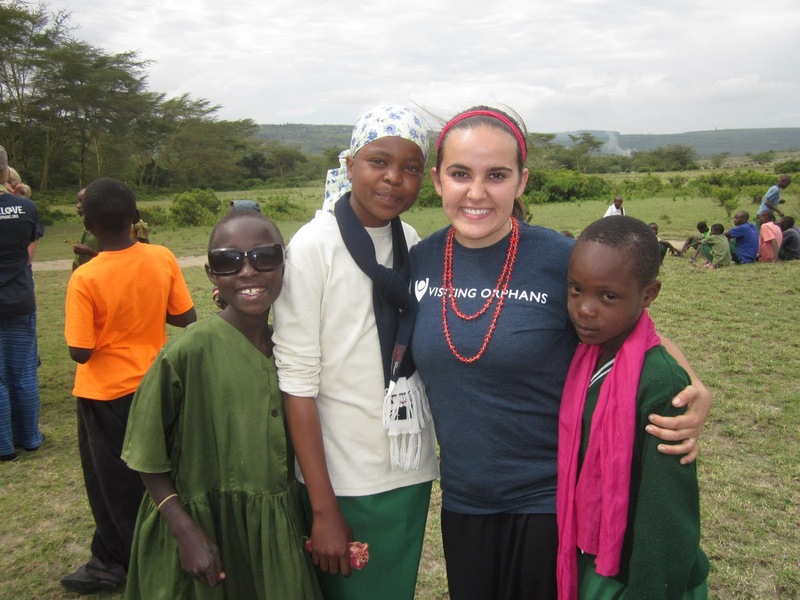 It was on that trip to Kenya & Uganda that my heart was wrecked in the most wonderful way. I purposed in my heart that I could not simply travel to Africa and not come home and take an action step to help make a difference. Upon returning home, I formed my own non-profit organization called Project Hazina (Hazina means “treasure” in Swahili). Project Hazina provides pillows, blankets, and mattresses to orphans as well as funding for projects in East Africa through the sales of fair-trade jewelry made by artisans in India! God has blown me away with his faithfulness in that journey as I have simply just continued to hand him my “yes”. When you hand God your yes, it is absolutely amazing to see what He does with it! I am deeply passionate about orphan care and adoption and have worked in the adoption field serving adoptive families. I have had a heart for missions since the age of 14 and have had the deep honor of serving in over 40 Nations all over the world. Growing up I always knew that God had called me to be a “goer” and His faithfulness to provide for every single one of my trips still leaves me in awe! Never let the fear of raising money keep you from going on a missions trip! Step out and watch God move! The process is truly so exciting! I am bursting with joy and thankfulness to announce that I have the honor and privilege of being VO’s latest staff member! I have joined the team to work as a Missions Assistant, working in admin, a little bit of bookkeeping, and social media. 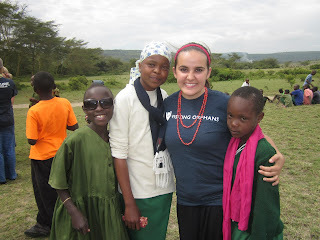 I will also be working to help coordinate VO’s trips to Kenya, Uganda, and India! This is truly a dream come true and a huge answer to prayer, I’m still pinching myself! To think that this journey started by simply feeling led to go to Kenya & Uganda with VO and now I am on staff, leaves me absolutely speechless. I cannot put my thankfulness into words! I am deeply excited to see how God uses me in this role at Visiting Orphans and cannot wait to dive in! My husband Chris and I have been married for 5 years (next month!). We met in an airport baggage claim area and have been adventuring together ever since. Last year we sold everything and backpacked to 25 countries serving in missions wherever we went. It was the most incredible year of our lives so far and we are even writing a book about our trip! I love to spend time with my big family (I'm one of seven kids!) & friends and spoil my 4 adopted baby siblings. I love coffee, Chipotle, blankets, globes (my husband has banned me from buying another one! ), running races, discovering companies that give back and shopping fair-trade whenever possible, watching the sunset at the beach, and going to see a movie! I am never without at least 2 books in my purse, I have a slight (major) obsession with cream cheese and I love to decorate my house constantly! I have such a desire to get know each of you individually! Please leave me a comment and tell me how you came to join the VO family and what trip(s) you’ve gone on or are planning to go on and tell me about yourself! I love all of my fellow world changers out there! I will be praying for each of your journeys daily! 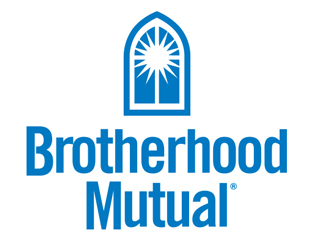 A past mission trip winner sponsors this year's giveaway!!! I could not believe that I actually won the mission trip in 2012! I had actually been wanting to go on a mission trip with VO for awhile, but the funds just weren't ever there. I grew up in church my whole life, but never really understood until about 5 years ago what it meant to "have a relationship with Christ." One day God really spoke to me and challenged what I believed and why I believed it and got me to dig deeper into really communicating with Him and developing a relationship with Him. The more I studied, read my Bible, and talked to my heavenly Father....He pressed on my heart His calling for ALL of His children to look after the orphans, the poor, and the widows. I have been striving to do that DAILY since then. What you believe can not be different from what you do! I thought that I just had to go to Church on Sundays and be a "good person" and I would go to heaven. But the more I read God's word, that is not what He tells us at all. The parable of the sheep and the goats in Matthew 25 really hit home for me. You always hear the part "whatever you did for the least of these, you did for me".......but I had never heard the very next part where Jesus says ""what you DID NOT do for the least of these, you DID NOT do for me. Then they will go away to eternal punishment, but the righteous to eternal life." We are God's solution for the poor, the orphans, and the widows. It is not a requirement to serve, but a privilege. Once I opened my heart to God, a flood of emotions came over me. It was like all of the hurt and the suffering that "the least of these" were going through.....I could feel it too. My heart broke for them. I immediately started serving locally, and have continued to over the past 5 years. Many people questioned why I would go on an international mission trip since I am already so active in my community. But I believe in reaching the lost and the hurting with the Gospel of Jesus Christ through acts of compassion in my hometown AND in other parts of the world. In Acts 1:8, the last thing Jesus told His disciples before ascending to heaven was, "But you will receive power when the Holy Spirit comes on you, and you will be My witnesses in Jerusalem, in all Judea And Samaria, and to the ends of the earth." I pray that others would answer His Call to go to the ends of the earth to share the good news by going on an international mission trip. By entering this giveaway you can possibly win a FREE mission trip too. 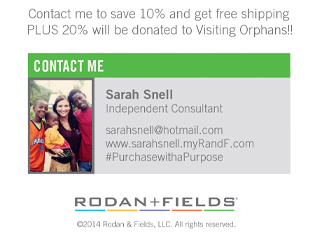 I am also going to continue to GIVE BACK to this amazing ministry by donating a portion of my proceeds from any sale through my Rodan & Fields business....just mention that you want your "GIVE BACK" portion to go Visiting Orphans! Contact me by email: sarahsnell@hotmail.com or on Facebook here - let me help you get the best skin you have ever had AND support an awesome ministry at the same time!! Message me and get 10% off and FREE shipping. Watch our brand new 10 year video above and then get involved by supporting Visiting Orphans between October 1st and November 1st, 2015 and YOU could win a free 2016 mission trip to any of the 14 countries we serve in. Keep reading to find out how you can get entered to win! 1. 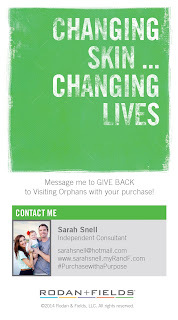 Get 1 entry for every $10 donated to Visiting Orphans. 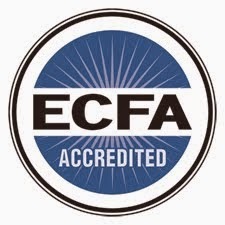 All gifts are tax deductible and help support current and future initiatives of our ministry. You can give now at our special Giveaway fundraising link here. 2. Get 1 entry for every $20 purchase (pre-tax and shipping) on our online store. One year the winner won the mission trip giveaway by buying Christmas gifts on our store! You never know - it could happen to you. 3. 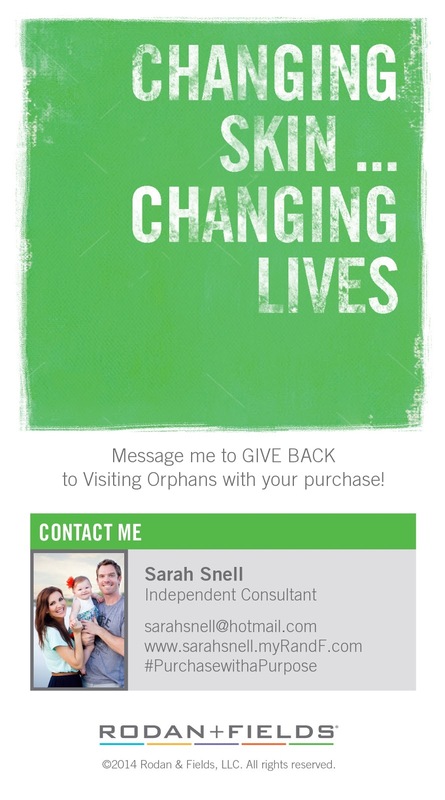 Get 10 entries when you become a monthly supporter of Visiting Orphans and set up your monthly gift of $10 or more here. Plus an entry for every $10 you give in the month of October. Monthly support is a huge way to invest in the work Visiting Orphans is doing to serve children and communities around the world. 4. Get 25 entries when you sign up and pay the $250 trip deposit for any upcoming 2015 or 2016 Visiting Orphans Mission Trip. If you're signing up for a trip anyway, now is the best time to do that. You could end up going for FREE! 5. BONUS ENTRIES: After you've entered the giveaway through any 1 (or more) of the above 4 options, you can get bonus entries by sharing our social media posts about the Mission Trip Giveaway each day on your facebook, twitter or instagram with hashtags #VOMissionTripGiveaway #gobelove #visitingorphans. You may get 1 extra entry per day between October 1st, 2015 and November 1st, 2015 when our Giveaway posts are shared and the hashtags are used. Get 1 additional bonus entry PLUS an entry into an extra drawing for a $50 store credit to shop on the VO store when you create your own video encouraging others to participate in the Giveaway by supporting VO in any of the 4 ways above. Make sure to use the hashtags so we can track all the extra entries. See our website for the official Visiting Orphans Mission Trip Giveaway rules and restrictions here. Special thanks to our sponsors who are making this giveaway possible. Manufacturer of unique and beautiful residential metal roofing systems. From where you are, to where you need to be. 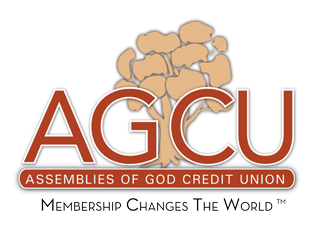 Insurance and payroll services for America’s churches and related ministries. The mission of Visiting Orphans is to GO to the nations, BE focused on relationship and LOVE like Jesus. Seasons of Autumn - GO. BE. LOVE.